A serious wine pairing experience without serious attitude. 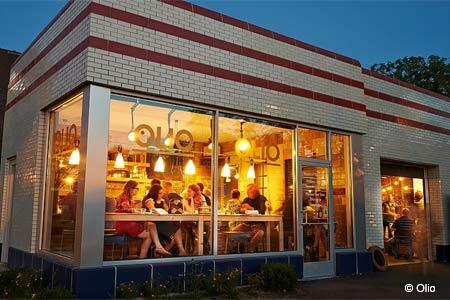 About the restaurant: Olio, situated in a former gas station, is both a neighborhood hangout and a destination for curious foodies. In fair weather, snag a seat on the outdoor patio adorned with string lights. Some prefer the casual vibe here to upscale sister restaurant, Elaia, with which it shares key staff members, including proprietor Ben Poremba and executive chef Ben Grupe. About the food: Cured meats, pickled vegetables and Israeli bruschetta are a lead-in to unconventional wine-pairing small plates like roasted cauliflower with tahini, green harissa and almonds. For larger appetites, there are stuffed pitas and tagines, short rib or root vegetables, served with turmeric rice and harissa. For dessert, opt for the Key lime pie-in-a-jar if it’s available. About the drinks: The wine and spirits lists offer international breadth and depth, and the seasonal cocktail program draws in regulars seeking whatever new pleasures the bartenders have in store.